Almost all US banking institutions offer remote deposit capture (RDC). That makes sense when you consider a recent remotedepositcapture.com survey of financial institution executives. It found 76% of respondents say the benefits of RDC "far outweigh" the risks and costs and another 20% say the benefits "marginally" did so. That is pretty good for any product and bodes well for RDC too - despite much higher BSA and AML costs over the years. 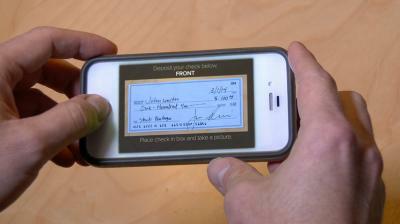 Most banks know they have USAA to thank for being able to offer customers the ability to deposit checks remotely. You see, over a decade ago USAA employees were trying to solve a problem for customers. Given those customers were mostly military it was not easy for them to get to a branch to deposit their paycheck. This led USAA to invent RDC to enable customers to deposit checks with a scanner from anywhere, and in 2009, USAA became the first bank to permit customers to deposit checks with a smartphone. Today USAA holds some 50 patents on RDC technology. For all banks, it is important to know that USAA is now offering to license the technology to you. That's right - the technology that has gained widespread adoption throughout the banking industry can now be licensed from USAA for a fee. Through EpiCenter Law PC, USAA has begun contacting banks and credit unions using RDC technology, asking to discuss a licensing program it has created for its patented technology. USAA said it is hoping to get the banks using its technology to voluntarily accept its licensing program, without the need to take legal measures compelling them to do so. So, how will this play out for community banks? Though USAA has yet to disclose how much it would charge banks to license its RDC technology, the shift is worth noting. For instance, today most banks do not charge customers for the ability to use RDC. However, depending on the cost, having to pay for this feature will impact banks and could impact customers. At the same time, it is clear RDC technology has become an integral part of the mobile banking capabilities that people have come to expect from their banks. Despite the fact that the increasing number of electronic payments has caused a downward trend in the number of physical checks written each year, checks still continue to play a major role in the payment landscape. According to the 2016 Federal Reserve Payment Study, Americans wrote 17.3B checks in 2016, with a combined value of roughly $26.83T. EpiCenter Law PC estimates that RDC technology has reduced the cost for banks to process a single check to less than $0.10 vs. $4.00 to process a check at a branch. As unpleasant as the idea is of suddenly having to pay a licensing fee for RDC, it is important to note that USAA holds many patents on this. As such, it will be something to think about and understand given high levels of customer usage. Of course, it is also likely that RDC technology companies will ultimately pass along any extra licensing fees they are forced to pay as part of all of this so be prepared. For now, we simply wanted to update you on this latest development so you can better understand it, and as needed, engage experts to help you in a constantly evolving digital world. Yields rose 2bp as the ADP employment number comes in close to expectations and ultra-long bonds deliberation was put on hold by The Treasury. 1) Community Bank of the Chesapeake ($1.4B, MD) will acquire County First Bank ($234mm, MD) for approximately $34.3mm in cash (3%) and stock (97%) or about 1.33x tangible book. 2) Bank of Marin ($2.1B, CA) will acquire Bank of Napa ($246mm, CA) for about $51.0mm in stock (100%) or 1.87x tangible book. 3) Providence Bank ($299mm, NC) will acquire Cornerstone Bank ($107mm, NC) for about $11.2mm in cash (100%). PwC research finds fraud incidents have increased by over 130% in the past year. Research by the Information Security Media Group on ransomware finds the methods most cited as the way ransomware typically tries to enter organizations are: email attachments (78%), users visiting compromised websites (48%), malvertisements (36%), we have never been hit by ransomware (20%), and exploit kits planted in vulnerable systems (15%). A FIS survey of senior level financial services decision makers finds only 30% of bank respondents say their existing technology infrastructure is fully optimized for growth. A World Economic Forum survey of executives, information and communications technology sector experts finds almost 58% see 10% of global GDP information as being stored on blockchain technology by 2025. Research by the Kauffman Foundation on small businesses finds business survival rates beyond 5Ys soared to a 30Y high of 48.7%. Deloitte research finds the percentage of public companies that have appointed technology focused board members has reached 17.4% vs. 10.1% back in 2010. Despite the increase, the research found only 2.9% of public companies appointed technologists to newly opened board seats last year. MIT research finds the top 3 biggest mistakes managers or leaders say they make with respect to digitally enhancing their company are: lack of understanding of digital trends and impact to the company (22%), lack of strategic direction (13%), and resistance to change (11%).